If I felt an overwhelming need to put my hands on the vintage crayons I mentioned in my last post, I could order them through Etsy from a collector in Australia. But it’s enough to see the box again. I don’t need to touch or to use the crayons. I felt differently, though, about another childhood toy I rediscovered eleven years ago. My daughter and I had been rummaging through my parents’ attic, a treasure trove of miscellaneous stuff. D was six at the time. Nearly hidden in the shadows, on a shelf atop a stack of early-80s National Lampoons, I found a box I hadn’t seen or thought about in years. I’d purposely kept it out of D’s reach, to protect its prized contents from chubby, clumsy toddler hands. 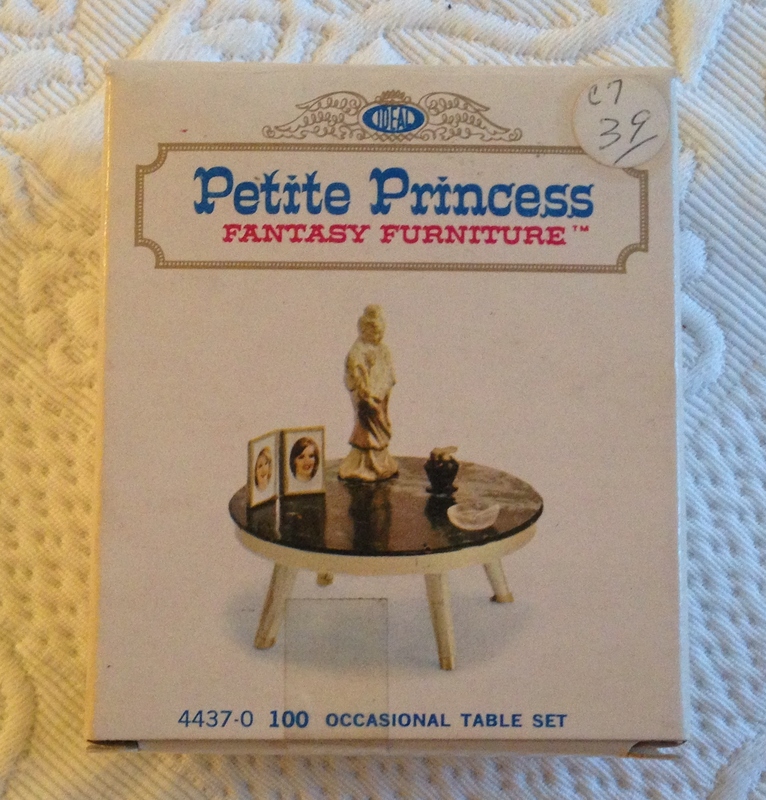 The somewhat misleading hand-scrawled label read “Plastic Doll Furniture.” No big deal, you’d think. 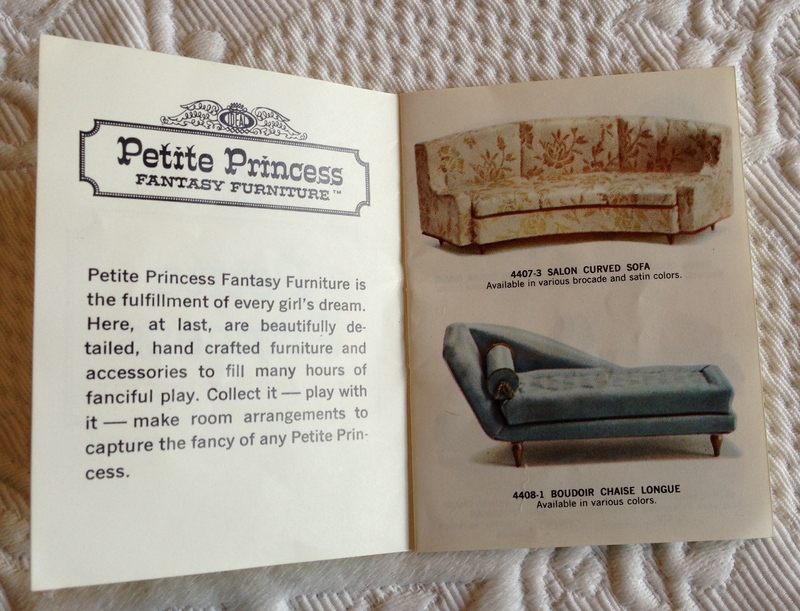 But this was “Petite Princess Fantasy Furniture.” It’s special. And the older I get, the more special it becomes. I first saw the furniture shortly after we moved to Atlanta, when I was five. It was on display at Allen’s 5 & Dime, a store now long gone, but then across from North DeKalb Mall. 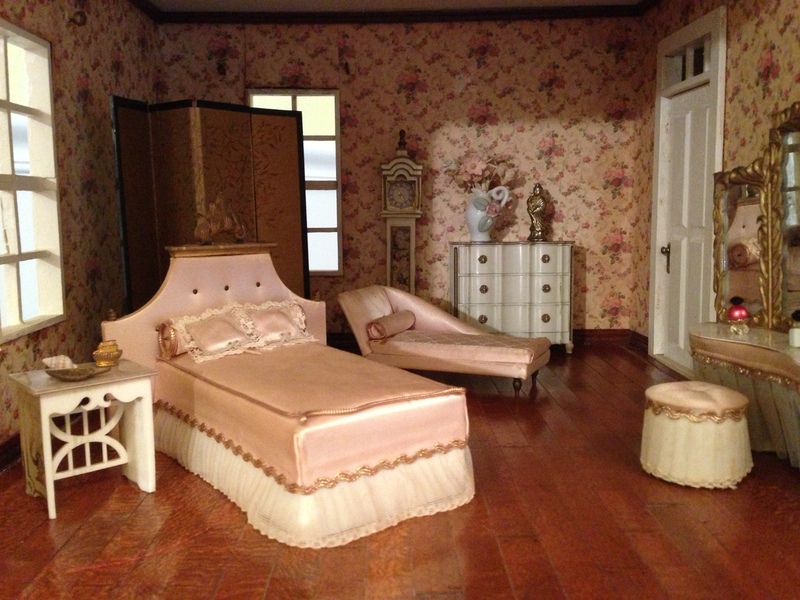 I vaguely recall a glass or plastic-fronted castle-like display showing various rooms of furniture, artfully arranged. Items available for purchase were stacked in small white cardboard boxes. This was long before the advent of clear plastic heat-sealed packaging that requires professional cutting tools to open. 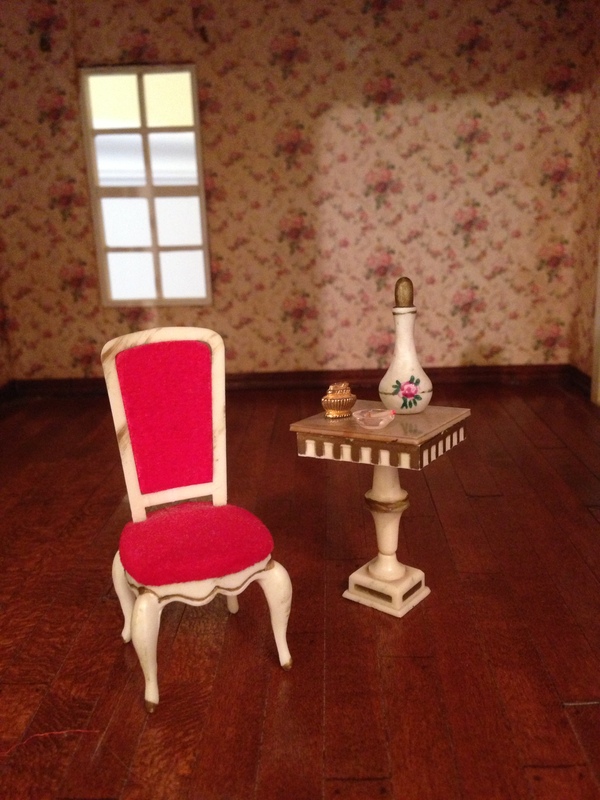 Each box bore a photograph of its contents, such as the “Palace Table Set” above. I remember carefully comparing the photos on each box with the items on display. I remember most particularly the excitement of choosing a new piece. 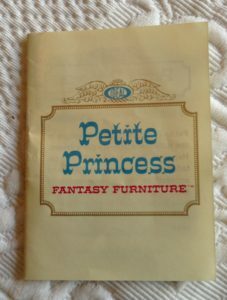 Inside each box was a tiny catalogue with photos of all the furniture and a list of every item in each set. The collection was limited; it easily fit on the twelve pages of the pamphlet. I would pore over the booklet in anticipation of future trips to Allen’s and upcoming purchases. As I’ve learned in recent years, the furniture was manufactured by the Ideal Toy Company for one year only, in 1964. Although produced primarily of plastic, the quality is excellent, the detail intricate. 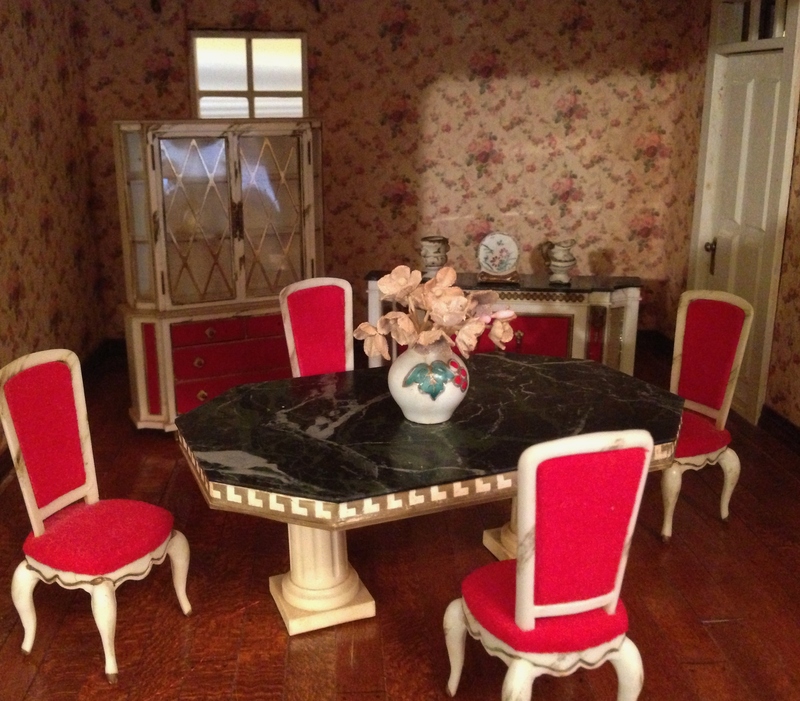 It’s a far cry from the generic sets of mass-produced molded plastic furniture dating from the same period. The style is pure glitzy 60s: swanky elegance suitable for an updating of the grand old chateau. Picture Sean Connery-era Bond girls swanning around in palatial digs in Paris and Rome, and you get the idea. 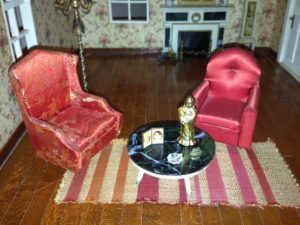 The scale is ¾ inch to a foot, so the furniture is smaller and more delicate than typical wooden doll furniture intended for children. Chairs, sofas and beds are upholstered in satins, brocades and velvets. Drawers open and close with minuscule brass knobs. The décor was very much of its time, down to the last detail. The Princesses at home with this furniture were stylish sophisticates who liked to party. 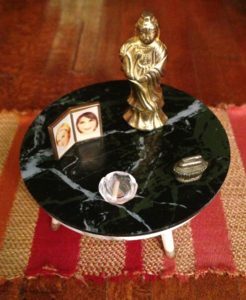 The marble-topped occasional table set pictured above includes, in addition to a Buddha statue and framed pair of photographs, a brass cigarette lighter, clear plastic ashtray, and even a teeny-tiny cigarette with a glowing red tip. The Palace Table set in the earlier photo includes a porcelain decanter, three wine goblets, and a brass leaf-shaped ashtray. My wine goblets disappeared years ago, but the decanter and leaf ashtray remain. 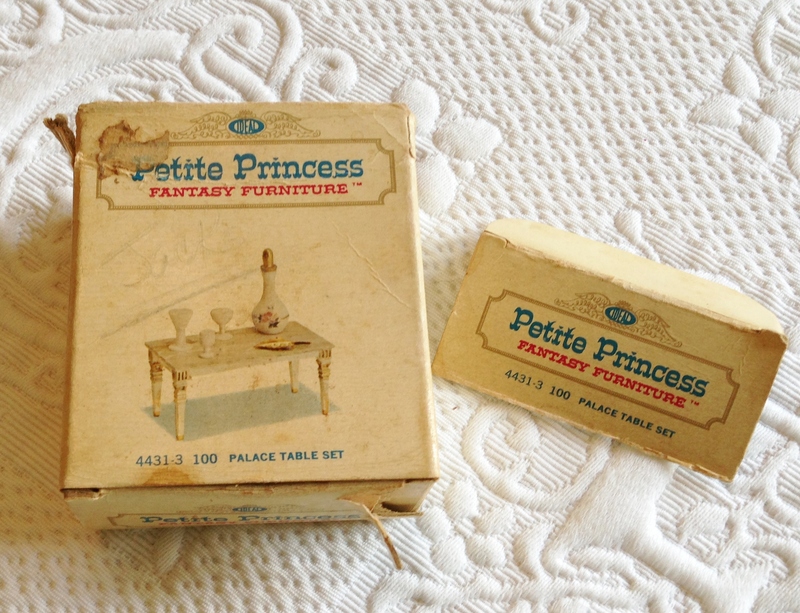 As a child, I relished the thrill of acquiring each piece of Petite Princess furniture. I appreciated its delicacy and the fineness of detail. But in all truthfulness, I found it too slick. It veered toward tacky. 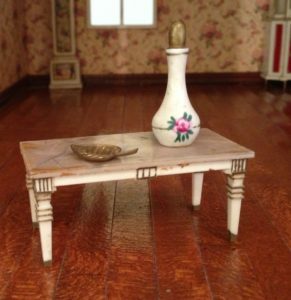 In my early 60s world, home décor was considerably more subdued: a mix of colonial American reproductions and old family antiques. All that white, gold and glam–that wasn’t Mama’s taste. So it wasn’t my taste, either. 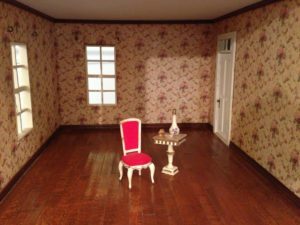 Like a woman dressed in a long slinky gown at a baseball game, the furniture looked uncomfortably out of place in my plywood Cape Cod doll house. Now, though, looking back through a haze of nostalgia, I see more clearly. I realize the appropriateness of the name: Petite Princess Fantasy Furniture. Its realm is the early 60s as seen through a rosy Hollywood lens: an airbrushed, carefree, consequence-free world of the wealthy, healthy and eternally young. Of lunchtime martinis, cigarettes in elegant silver holders, Dean Martin songs. What once struck me as tacky now heightens the appeal. Of course the stuff is over the top; that’s the point. Decades later, these little pieces of fancy plastic are much more than toys to me. I’ve turned them into talismans of an imagined era long past. You’d think they’d be heavier now that they carry the weight of memory. 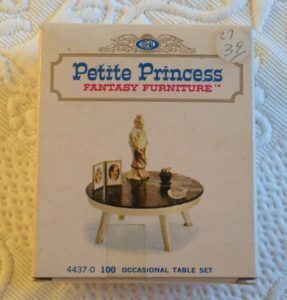 Once I rediscovered my Petite Princess furniture, I knew I wanted more of it. I wanted the anticipation before the purchase. I wanted the excitement of opening one of those little boxes again.